Nature may abhor a vacuum, but, apparently, it adores symmetry. On February 16, 1992, one of the people who indelibly shaped my life—my maternal grandmother—died. Feelings of security and optimism and a sense of self, now so resolute that they seem hardwired into my DNA, got their toehold in quiet afternoons cooking with her at her ancient white stove, a triple layer of cardboard wedged under one shapely leg—the stove’s, not hers. This February 16th, someone else who had an impact on my life died. 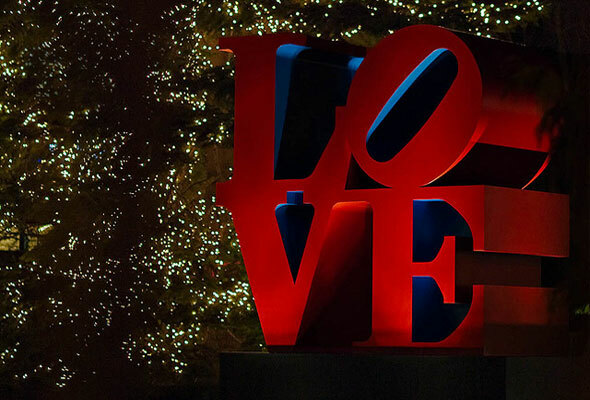 It’s not, mercifully, The One, a family member, or a friend. But still, my life got a little dimmer—by about 100 watts. The person: Ronald Howes, Sr. 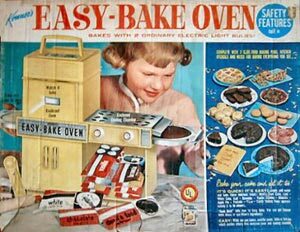 In the early ‘60s, Mr. Howes invented the toy that, powered by two low-watt light bulbs, came to delight battalions of little girls—and me: Kenner’s Easy-Bake Oven. Just as my grandmother found ways of shunting my breathtaking lack of athletic prowess into hours of cooking, Mr. Howes gave me an out. And an outlet. Whenever my three cousins—Barry, TJ, and Jeff—would ask me to go out and play some form of ball (whether base, foot, or basket), I had an excuse. “I’m baking cakes with Claire,” I’d shout through the window. Claire, another cousin, was the official owner of a harvest gold Easy-Bake Oven. And when the inevitable and expected ridicule was heaped on me, I would bake with a fury. I remember pushing the low, flat tin of batter in one side of the oven with a plastic tool and waiting those impossibly long minutes—how many? Three, four, eight, twelve?—until I could retrieve it from the other side, the cake now domed, warm, and screaming, “Eat me, David! Eat me now!” So enamored of the oven was I that I actually stole one from a neighbor on Lindsey Street in Fall River, MA. Yes, I committed a felony in the name of American baked goods. How I snuck out of her third-floor tenement with the oven under my coat, slid it into my parents’ old blue Buick with a front grill that looked like an encyclopedia salesman’s glinty smile, and set it up in the basement is beyond me. But the compulsion for coconut cake knows no bounds. As I grew, that primary need to be close to my grandmother and all her kitchenry had to be replaced by more appropriate things (“Otherwise, how will the boy get along?” I heard muttered from my parents’ bedroom at night). So, in the name of Little League and Cub Scouts, I began to lose the connection to the two most important stoves in my life: I stepped off the chair my grandmother had always dragged to the counter so I could cook at her side, and I lost track of my pilfered Easy-Bake Oven. Childhood rushes headlong into adolescence, which beats a hasty path to adulthood, which only reluctantly agrees to middle age. At the half-century mark, I’ve forgotten the name of that little girl, the poor victim of my crime. Gone are my cousins’ words that cut. Vanished, even, is my grandmother’s house, which was ripped down in favor of a highway. What remains? The memory of that stove. Squat, plastic, and perfect. Perhaps Mr. Howes understood the true secret of toys (he was, after all, part of the team that created the amazing Spirograph). It’s not so much the fleeting joy of playing as a child, but rather the enduring pleasure as an adult of remembering we once played. Editor’s Note: How did Mr. Howes’ Easy-Bake Oven sweeten your childhood? Share your memories, your pre-teen baking disasters, or the launch of your pastry-chef career here by leaving a comment. I enjoyed this post very much. But what’s the saying…everything old is new again? My five year old granddaughter, Mary, and her VERY patient mother (my daughter) baked and frosted individual cakes with Mary’s Easy-Bake Oven for my daughter’s birthday just this past November. Six of them. Now, that’s a good mommy, in my book! Mine was turquoise just like in the photo here. I loved making the pizza and the brownie. I still have my spirograph, but alas don’t know what happened to my oven. my own daughter owned an easy-bake oven, history came full-circle. the spriogragh was also another favorite toy from my childhood, again enjoying second generation play. what an amazing ability to retain childlike wonder and fascination—i would like to think that mr. howes had that quality in abundance. thanks for sharing this! My 8-year-old has a pink and purple one. It’s a little more Barbie-ish these days then my green one was back in the early 70s, but the underlying genius is still there. Get them in the habit early of exploring food on their own terms. It’s so interesting. I don’t have children, so the Easy-Bake oven is frozen in time and place for me. I almost DON’T want to know it’s evolved and changed. I want today’s kids to use that blocky turquoise oven to bake cakes and brownies unevenly. But as you all mention, it’s good to get kids cooking/baking earlier. I wonder, since the trend to invite children into the kitchen is gaining momentum, if more boys are baking with the oven, or if Hasbro is planning to make it the oven gender neutral? I don’t remember what color my 5-year-old granddaughter’s Easy-Bake is, but her 11-year-old brother wouldn’t hesitate to bake with her and her oven. His real passion is sports, but he loves cooking, too. Plus he’s a good big brother. Ahhh, memmories. I still have my turquoise-blue model in its original box, circa 1963. I’ve never been able to part with it. I baked my first cake for the boy next door and was impossibly teased for it. I remember that the cost of the mixes were pricey for my family, so I didn’t get them very often. I believe my parents gave me my oven because I showed an early interest in baking, and I still consider myself more of a baker than a cook. Clearly you’re better off having made due without the mixes, given my and others’ recollection about their flavor. The chocolate brownies actually reminded me of how I imagined the little paper or foil mix packets tasted. Trust me, you’re one of the lucky ones! My mother said the same thing when I asked for one! But then again, she never had a Barbie doll, so it only seems fitting that she never gave me an Easy-Bake oven. Me, too! Everytime I asked my mom, she would offer to bake something with me in the real oven. Not the same as making a cake in your bedroom, is it? just wrote my homage to the oven. so wonderful that this guy also invented the spirograph, a toy i’ve recently been nostalgic for. Melissa, great homage. Funny how this toy has touched so many of us. I got my Easy-Bake Oven when I was 11 years old. My parents definitely thought I was too old for this “toy,” and I rarely got gifts when it wasn’t a holiday or birthday. But I begged my parents so much for my own “oven” that they finally broke down and bought it for me. About this same time, boys would knock on our door and ask my mother if I was home to get together with me. I thought they were interested in me but as soon as they’d see my Easy-Bake Oven, their interests turned from childhood romance to playing with my oven. I was surprised that they liked it so much but had a great time “baking” with them! David, I do enjoy your writing! 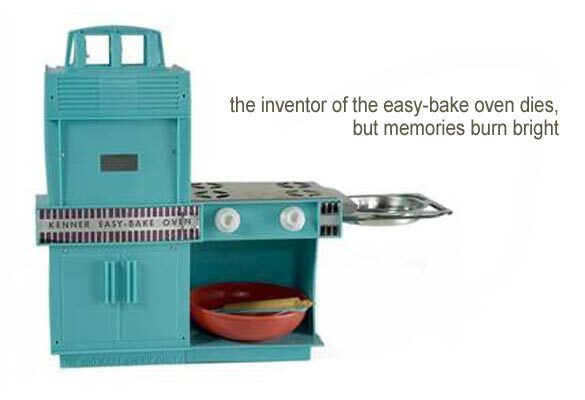 I, too, had an Easy-Bake Oven, which I loved. I don’t know what happened to it, but my Sno-Cone Machine is in the basement. My memories are of my grandmother rolling out dough for noodles and kreplach on a large cloth on the dining room table. I never owned a Barbie Doll—I much preferred baking to dolls. Thanks, Jamie. And you nudged a memory that was completely forgotten: the Sno-Cone machine. I remember setting up a stand during the summer at my grandparents’ house and selling cones. My mother even made different flavored corn syrups so that I could offer a greater variety. I don’t remember selling many cones over the chain-link fence, but I do remember eating a lot of the inventory myself. This article and the posts bring back a lot of memories for me, too. I never had an Easy-Bake Oven. But in the ’60s, when I was seven and eight, I wanted one as much as I have ever wanted anything. My mother was also in the “we have a real oven” camp, and, although we had money for what we needed, an extra “oven” was out of the question. To her credit, she did buy me one of the largest assortments of mixes that Sears sold, and the little pans, so I could bake with those on the real oven. She helped only with the actual oven. I have some memory of how they tasted, which was not that great, but I had a lot of fun with the little mixes and they did start me on my baking hobby. But still wished for the oven! I didn’t know the same inventor invented the Spirograph. I did have one of those and have always thought it was a great toy. I had an easy bake oven, a blue one….my mom and I hated the taste of the mixes it came with, so we’d try to make up recipes to then bake something different in the oven…eventually she just gave in and let me use the real oven! I felt a little lump im my throat when I read that Mr. Howes passed away. How I loved that Easy-Bake. I don’t think my parents had any idea what was to begin with that Christmas present. Enraptured, I would glue my eyes to the tiny window watching the miracle of a light bulb and a scant cup of batter. Those first cakes were such a success that Bing! I realized I could go into business! I bought a big box of cake mix with my allowance and started baking. Math was not my forte at age six and I never got the dry/liquid ratio right so the soupy concoctions wouldn’t rise no matter how long they sat in the “cook position.” My mother would drag me sobbing to bed after staring at the bulb for hours and still no cake. Undaunted by my first foray in the retail food world I went on to become a pastry chef and had a successful business making wedding cakes. All because of Mr Howes and a 100-watt bulb. Rest in peace, Mr. Howes. May flights of cupcakes sing thee to thy rest. Oh, the memories provoked by this post! I, too, had an Easy-Bake Oven, although by the time I received it I was already cooking in my mother’s kitchen. She says I began pleading “Want to help!” when I could barely speak and still needed a stool to reach the counter. Initially, I peeled the blanched tomatoes in preparation for canning and stirred the ingredients for tuna salad. Before long, I was making Beef Wellington and Baked Alaska and cooking meals for my five younger siblings in rural south Georgia, to the amazement of my family. So why did my cash-strapped parents invest their limited funds in a toy oven for me that Christmas? Perhaps they hoped to prolong childhood for a kid charging full-tilt toward adulthood. I must ask them. Anyway, my turquoise Easy-Bake was abandoned soon enough, in part because we could not afford the mixes, and in part because the big kitchen and my mother’s cookbook collection called to me with their infinite possibilities. But while the mixes lasted, I experienced the wonder of watching those cakes rise through the tiny glass window, something not possible through the solid door of my family’s oven, and I began to learn that the mechanisms for cooking are limitless—you can create deliciousness even with something as simple as a bulb. And therein lies the beauty of the Easy-Bake. Thank you, Jana, for sharing such a touching story. Off topic, and not. Speaking of boys and cooking…I was watching “Leave It to Beaver” with my 9-year-old. I got it from Netflix and made him watch it with me against his will. “You WILL relive my childhood.” Beaver would not put on an apron at school for some project or other (the details escape me), and my son wanted to know why? I told him, “Hmm, I don’t know. How odd.” My son wears an apron for cooking—with a skull and crossbones on it—and doesn’t know that aprons are just for girls. Ha! Lisa, excellent! We all can learn a thing or two about the silliness of gender bias from your nine-year-old chef! Mine was yellow and I have such wonderful, fond memories of it. What a thrill it was to get my first one and to actually bake something in it! I’ll never forget it. my mom just made extra batter when she made homemade cakes and we baked that in the easy bake oven. cheaper and tasty. my grandmother was very proud that 1st word i could spell was biscuit—obviously spent a lot of time in kitchen. good for math, reading, and science skills for kids. As a little girl, I enjoyed using my easy-bake oven. It was one of the neatest toys I ever had. I was not easily amused by a lot of toys, but this one definitely did the trick. Between my easy-bake oven and my continuous search for making the best mud pie, I knew I was destined to become a pastry chef. I did a lot of baking as a teenager, took classes during high school, and went on to advance myself at The Culinary Institute of America. I graduated with a Bachelor Degree in Baking & Pastry Arts Management. I have been in the field for over 14 years and I still love it to this day. Thank you Mr. Howes! I never had an Easy-Bake Oven. I remember feeling “deprived” because of that lack–for about three minutes. After all, I had been using the real oven since about age four. And by age seven, I had become the family french fry cook. Fortunately for her blood pressure and delicate nerves, my mother died having never learned that my much older siblings actually had me slicing and deep-frying for them in her absence! It was decades before the scar that came from slicing a hunk of my thumb off on the mandoline faded. Wow, cooking in a real oven since the age of four. You were probably a pro by ten!